It's a standard American ritual. Today, you'll probably be booed at by scary tricksters knocking on your door, demanding sugary treats. Perhaps you'll see a chainsaw-wielding demon on the street and laugh. Or maybe you'll dress in scary costumes and get a kick out of reveling in and even poking fun at Halloween's fantasy of fear and death and danger. Of course, some of us don't have to rely on the eve of All Saints Day to be immersed in dark times and emotions. Those who've been to war have tapped fear and death and danger on the shoulder. They've lived the more difficult side of life. 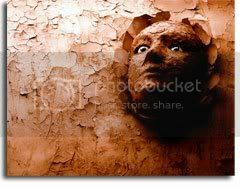 And many, when they return from the pit of hell, struggle to find the inner and outer security and confidence long since lost to them on some dusty combat trail. Getting their life back isn't as easy as peeling off a costume, wiping off the fake blood or putting away a candy dish. I wonder what they think about Halloween? Below the fold, a few recent articles that reveal how the daily fear, anxiety and solitude of PTSD affects some of our recently returned troops. Read as many of them as you can find time for. Let's jump right into the data. Post-traumatic stress and traumatic brain injury have outcomes as devastating as those from physical injuries, and everyone is vulnerable, Shinseki said, noting that both departments are eager to learn how to better address those injuries through various programs and methods. The debilitating effects of psychological trauma can lead troops and veterans into a downward spiral of drug and alcohol abuse, homelessness, anger issues, failed marriages and eventually suicide, he explained, noting that more veterans have committed suicide since 2001 than the number of servicemembers killed in Iraq and Afghanistan over that period. Although I could have missed it, this is the first time I've seen the volume of OEF/OIF veteran suicides so clearly presented to the American people by a top official. A book review any author would be bowled over by (this one being no exception) appears in the premiere issue of the VA's Veterans Law Review journal. It's much more than a mere review, however. Almost every week there is a different news report concerning the recovery and treatment of veterans returning from the Persian Gulf. 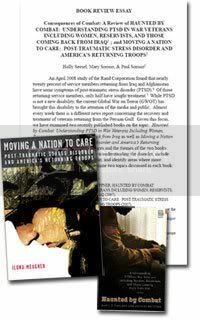 Given this focus, we have examined two recently published books on the topic: Haunted by Combat: Understanding PTSD in War Veterans Including Women, Reservists, and Those Coming Back from Iraq as well as Moving a Nation to Care: Post-Traumatic Stress Disorder and America’s Returning Troops. While the intended audiences and the themes of the two books are different, both offer insights into understanding the disorder, include suggestions for improving treatment, and identify areas where more research is required. We will examine two topics discussed in each book: the changing face of PTSD and treatment options for PTSD. 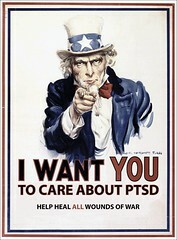 We will then offer suggestions for treatment of PTSD and highlight areas where further research is most needed. In extended, I've included VLR's welcome by Secretary James B. Peake, its table of contents and another clip from the review. A lot of good info -- and all available freely online from the VA.